Moms pretty much worry constantly about what goes in and what comes out of our children. Trying to discern what “normal” poop looks like is nearly impossible. This gallery of poop and pee diapers aims to provide a variety of diaper experiences and age ranges. Special thanks to all the babies who so generously made this gallery possible. This gallery is not intended to provide medical advice or diagnose any GI or feeding condition. Please contact your doctor, lactation consultant, and other health care team members if you are concerned about your baby’s diapering patterns. This is a meconium diaper on day 2 of life. This baby is exclusively breastfed. This baby is 9 weeks old. His mother has heavy oversupply of milk causing his stools to be green at times. This diaper contains uric acid crystals, commonly called “brick dust” urine. This baby is 1 week old and having difficulties with both formula and human milk feeding. This baby is breastfed and has begun solids. The family uses “Baby Led Weaning” method of introducing solids. The baby is 8 months old. This diaper was made on the 5th day of life by a baby who was being fed at the breast and supplemented with formula. This diaper is from day 6 of life. The mother is experiencing heavy engorgement and oversupply of milk. This is a 4th meconium stool from a baby on his 3rd day of life. 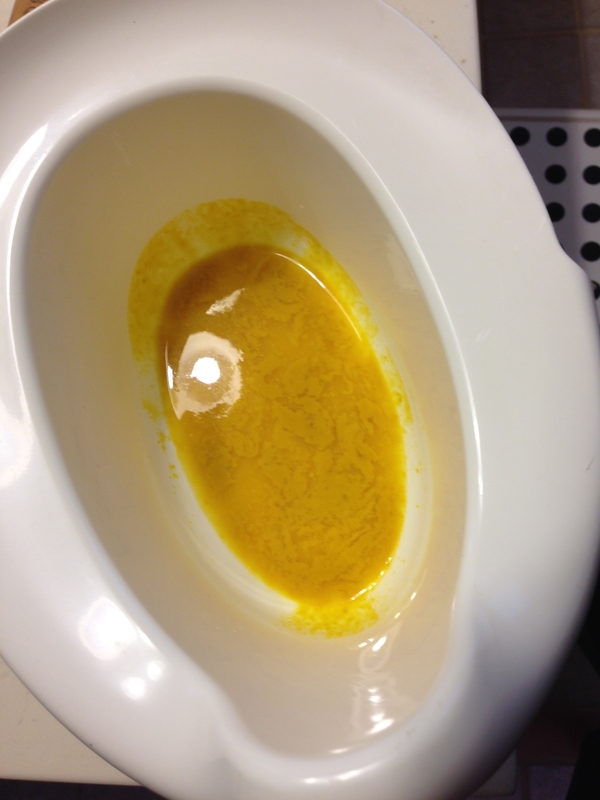 There is blood discharge in the urine. This baby is exclusively fed human milk by breast and syringe. This is the stool of a 5 month old baby who is exclusively breastfed. The mother suspected cow milk protein allergy and has changed her diet to be dairy free. This is the stool after mom had been dairy free for about 1 week. This baby is 5 days old and exclusively breastfed. The stool still contains a bit of meconium. 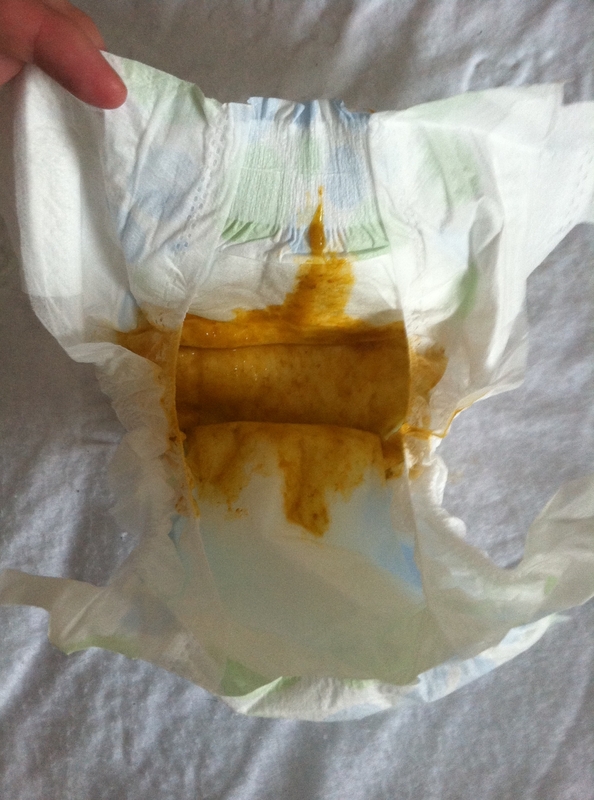 Yellow fluid has absorbed into the diaper. This is a “caught” stool and urine from a 1 month old exclusively breastfeed baby whose family practices elimination communication. The stool is in a white basin and not absorbed into a diaper, showing the normal volume of one stool plus one bladder elimination. 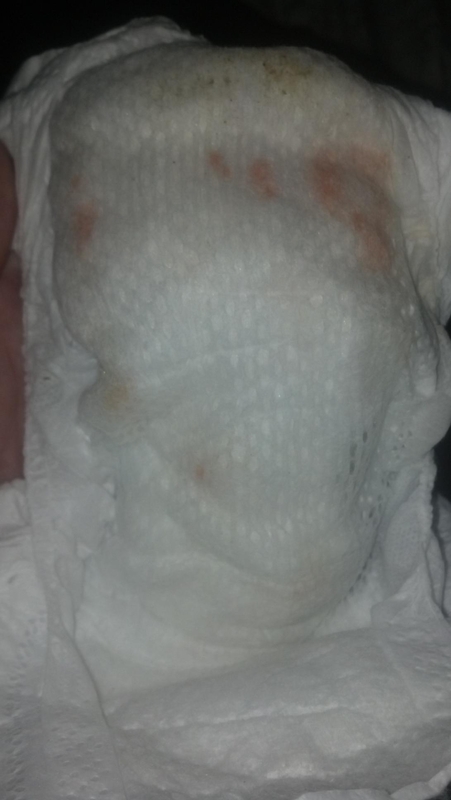 This diaper was made by a baby who is 2 weeks old, mostly formula fed with some nursing.